You are about to indulge yourself in one of my favorite holiday recipes. This recipe comes from my dear friends’, The Beekman Boys, newest cookbook, The Heirloom Cook. The cookbook has over 100 recipes that the boys have adapted from their own family archives. It also includes blank recipe cards and pockets in the book to collect your own personal recipes. The cookbook makes a great gift for holiday parties, housewarming parties, weddings, or any occasion! Not only can the recipient get an entirely new set of recipes, but they can also add in some of their family’s own classics. 1. Preheat oven to 325 degrees F. Tuck wing tips under turkey by bending them back and pushing them under wings. In a small bowl, combine salt, sugar, and chile powder. Carefully run your fingers under breast and thigh skin to loosen, then rub meat with about one-third of seasoning. Rub remaining seasoning in cavity of turkey and all over skin. Next, pierce orange and lime with a fork, and stuff citrus in cavity, along with onion, bay leaves, and garlic. Using kitchen string, tie legs together. 2. In a small skillet, stir maple syrup, molasses, brown sugar, and Worcestershire sauce. Bring to a simmer; let cook for 5 minutes. 3. Set turkey breast side up in a large roasting pan fitted with a rack. Put turkey neck and giblets in bottom of pan and add bourbon. Pour all but 1/3 cup of maple-syrup mixture over turkey. Cover pan with lid or buttered aluminum foil. Roast turkey, covered, for 1 hour 30 minutes. 4. 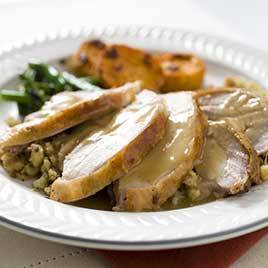 Uncover pan and brush turkey with reserved maple-syrup mixture. Return turkey to oven and continue to roast, uncovered, until an instant-read thermometer inserted into thigh meat registers 165 degrees F, 40 to 50 minutes. Lift turkey from pan, allowing any juices in cavity to drain into pan, and transfer to a platter or cutting board. Tent turkey with foil and let rest for 30 minutes. 5. Discard neck and giblets and pour juices from roasting pan into a gravy separator or a large measuring cup. Remove fat, reserving 3 tablespoons. If needed, add enough water to pan juices to measure 4 cups. 6. Place reserved turkey fat in a large saucepan over low heat. Gradually whisk in flour and cook, whisking constantly, until flour has browned, about 5 minutes. Gradually whisk in pan juices and cook, whisking constantly, until gravy is creamy and slightly thickened, about 10 minutes. Check out the Beekman Boys’ site and their new book here.